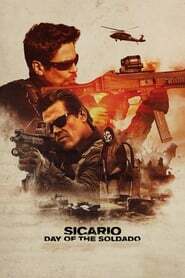 Plot: FBI agent Matt Graver teams up with operative Alejandro Gillick to prevent Mexican drug cartels from smuggling terrorists across the U.S. border. First one was great. Proper tense and the Nolan-esque soundtrack in particular keeps you right on the edge, especially the scene with the motorway traffic jam. Went to see this last week, I thought it was really good. Not as good as the first but well worth a watch. Benicio del Toro is great in it.